The quest for a Goldilocks Knife, or one that’s just right, is less a journey and more of a marriage. To trust one’s fate to one single blade especially for survival situations, there must be a commitment to making the best of the situation regardless of the challenges. Thick and thin, sickness and health, and all that. 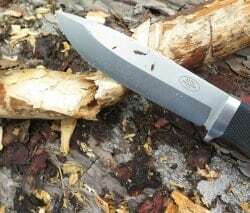 In additional to personal preferences, there is a small handful of knife characteristics that can be adjusted by blade makers including those addressing the grip such as size, thickness, materials, guard options, and shape. And for the blade there is steel type, length, thickness, grind, shape, and overall size. Of those eleven characteristics, even if each one only had two options, that would be 2 to the 11th or over 2000 combinations. But of course each option has many more than two possibilities, with some nearing an infinite number of choices. 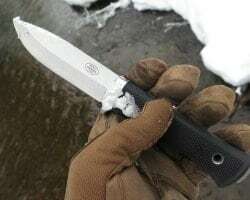 Goldilocks might be a fairy tale, but the Fallkniven S1 Pro Survival Knife is very real and very sharp. Even in its own lineup of Pro Knives, puts it right down the middle. Not too much. Not too little. Flanking the S1 are the larger A1 Pro and the smaller F1 Pro. With the A1 being noted for its large size and the F1 a designed for smaller cockpit carry, something in between should be just about right. But “just about” is not enough to be “right” when looking for the perfect knife. Looking at the features of the Fallkniven S1 Pro, it is clear that while this particular knife is smaller in some aspects, but no less potent. For instance, the blade thickness of the S1 is an amazing six millimeters or just shy of a quarter inch. And that’s on a blade only 5.1 inches long. Speaking of the blade on the Fallkniven S1 Pro, it’s a cobalt steel convex edged masterpiece. The steel is amazing from both the standpoint of overall sharpness and durability. In the never ending search for the perfect steel, blade steel makers have been dabbling at the atomic level with chemistry, crystal structure and the optimum blend of edge shape and cutting performance. The best steel can be neutered by a poor choice of grind, and a marginal steel can be given superpowers with the right shape and grind. But ultimately, one wants the the best of all worlds; the best steel with the best grind, and the best performance characteristics. And it seems the Fallkniven S1 Pro has come as close to this Goldilocks formula as anyone ever has. Fallkniven uses an enhanced convex grind on the Fallkniven S1 Pro as well as its other Pro blades. The convex grind is an advanced grind with no simple characteristics or ease of manufacturing which is why the convex grind is not a common option among knifemakers. The convex grind is a graceful arc from blade side to blade edge. Most designs transition the blade from flat side tapering linearly to a point where a sharper angle dives towards the absolute edge. It’s an effective strategy for 99% of the uses, but what about the 1% that really matter when it matters? That’s where the convex edge shines. The heavy blade chops like a dream. A small dream, but one nonetheless. 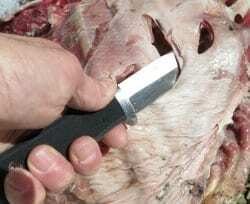 And the S1 Pro can slice all day long without a sharpener in sight. For a perfect sized knife, the Fallkniven S1 Pro as close to perfect as perfect can get.